Stallions Rocky and Carson Price help drop off gifts in anticipation of the Chicago Survivors Holiday Event on December 8th. The Chicago Stallions participated in the Chicago Survivor's 5th annual toy drive for children whose families have been victims of violence in Chicago. Chicago Survivors provides crime victim services to family members of Chicago homicide victims. According to the organization, Chicago reported 655 homicides in 2017, and a Chicago Survivors Crisis Responder was on the scene of every single one. As children are often hit hardest by these tragedies, Chicago Survivors has held a gift drive every year to help make the holidays a little easier on them. This year, the Stallions were able to provide gifts for nearly 50 children. 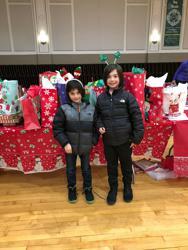 Gifts were given at their annual even on Saturday, December 8th where over 500 children whose families have been struck by violence participated. For more information on the Chicago Survivors organization, please visit https://chicagosurvivors.org/.